I’m just writing to you both to let you know that I installed the Easy Out this morning and was able to use it when I arrived home tonight. It worked great and I did NOT have to listen to my beagle Goldie barking until I reached her crate and could let her out. She just came running to greet me. What a delight. I’m sure my neighbors appreciate it too. I did not have any trouble installing the Easy Out. I love it so far and feel it is a very cool invention! A few months ago my wife ran over one of our dogs. We have three of them and they like to chase us down the road. We have a dog door leading outside of the house in the utility room which is accessed by a hollow core door in another room of our house. I purchased two (2) of the Easy Out devices and installed another dog door leading into the utility room and with little effort was able to install latches for the door flap attached to the 2 Easy Outs. What is great about this invention is now my wife and I can unlock the Easy Outs after getting a 150 foot head start down our road. We live in a very rural area on a farm whose road ends at our house so the dogs do just fine when they choose to be outside. Please tell the inventor that we are very pleased with his product. When it is necessary for us to be away from home for most of the day or overnight, we can release the dogs and they can come and go as they please. Thank you for giving us peace of mind knowing that our dogs are safe from injury. This is from two very happy customers. I would like to tell you how much my puppy and I have enjoyed using your EasyOut product. It was very easy and straightforward to install and I had it working in less than 10 minutes. Living in a townhouse with 3 floors, I spend a lot of time going up and down stairs, but this has saved me a lot of them! My favorite part though is when I press the remote control button and immediately begin to hear her running towards me as fast as she can from far away, and then she bursts into sight and sprints the last part to greet me! Also, I was also able to more quickly and effectively crate train her by incorporating the EasyOut. She now handles transitions to and from the crate with ease, confidence, and calmness. What she enjoys the most though is being released by the EasyOut. I think she sees it as an awesomely wonderful surprise gift she is receiving every time the door “pops” free and she is able to run to us and give us kisses! I can’t believe somebody didn’t invent this sooner! I have one of your pet release systems, and it was just what I needed! I have come up with additional capabilities for mine too! This is exactly what I have looked for on the web for months. I’ve always thought something like this would awesome! Thanks so much. I took me a while to find you, but well worth it. I am in process of building a new cat door, and I am really excited to find your Deluxe product. Thank you very much for your quick response, I just wanted to say thanks again; I searched all day for a product like yours with no luck at all. It will help us tremendously! Thanks for your quick response and great answers Les! That’s awesome! Beyond that, it is just so simple for me to put on my pot of coffee in the morning, press the remote button, and meet my buddy at the door (no stairs, for me anyway). I’m an electrician and I’ve been going back and forth thinking of ways to do just what you did, magnetic door releases with time clocks, motors, etc. glad I found this now I don’t have to think about it anymore LOL! Thank you very much! I really hope that this product will help with my dog’s separation anxiety. I just received a notification that the package already shipped! What a great invention! I need this to feed my dog refrigerated wet food. My plan is to buy a small crate with the wet food inside, on ice, to keep it cool. This way my dog can go in at a set time to eat when I’m not home. All of the auto feeders don’t work for me because its refrigerated wet food. So, thank you!! I mod it for my purpose on a gate for my outdoor kennel/dog run. Google it and watch all the differnt mod on YouTube. Lookd to be water resistance. Solid built. 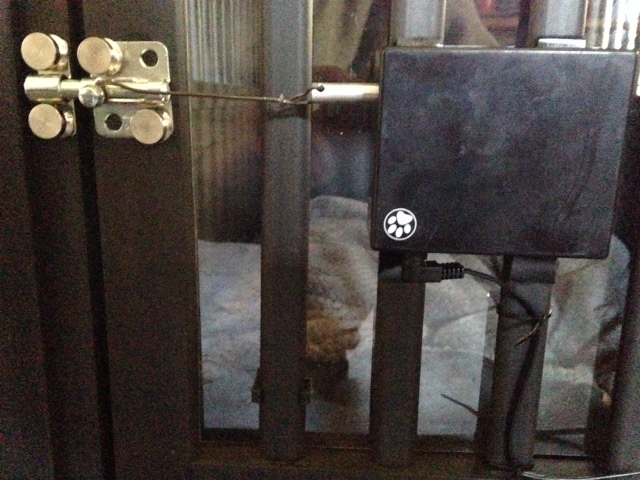 Now I don’t have to go outside in the cold to open the gate to let my dog in the house. I still have to put her in still, but it cut my trip outside in half. I can also release the gate if someone in in my yard without permission. Very happy with it. My husband and I have received the Easy Out all in good order. I have attached a small video and photo showing our new setup. Click here to watch the video! We think this is great and will be putting it to the test over the next few days. Thank you for this innovative creation! Click here to watch a YouTube video made by a happy customer showing how he used the Easy Out to keep his dog from dangerously following his car out of the garage! Hi Les! My name is Antonio from Tasmania Australia. I am so glad to have stumbled across your product as there is nothing like it available in Australia! I am up and out very early every day. My dog however that sleeps in his cage likes to get up later and I want to be able to let him out remotely from my business. I CAN’T WAIT TO RECEIVE AND START USING YOUR EASY OUT DELUXE! I purchased your deluxe single latch pet door opener to release birds. It was such a success my hunting fraternity wants me to construct a second bird release box. I will be ordering a second one. …… I installed 2nd box (no problem). They work beautifully! You have the best customer service I have ever seen, and everything works perfectly. I am so glad you invented this opener! I just want you to know that we received our Easy Out and couldn’t be happier. It works perfectly and we have it set up on our phones as well. It is just what we needed to stop the morning headaches of trying to leave home without running over our puppy who insists on running circles around our car. Thank you so much and thank you for all your help.